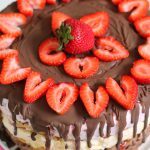 This impressive ice cream cake is actually simple to make, but it tastes amazing and will really wow your party guests! Begin by lining a springform pan with wax paper. This makes it easier to get each layer out of the pan. Place a single layer of graham crackers in the bottom of the pan. Spread a layer of softened ice cream over the graham crackers. Since I only have one springform pan, I made the first layer, stuck it in the freezer to harden, then popped it out of the pan and put it back in the freezer wrapped in wax paper so I could make the next layer. To save space (my freezer is full of stuff) I stacked the layers on top of each other. Unwrap the first layer of ice cream cake and place it on the serving dish. Spread 1/3 of the jar of strawberry topping on top. Repeat with all three layers of ice cream. Pour Magic Shell over the top of the cake and let it drip down the sides. Place the whole cake back in the freezer until serving time. Decorate the top with fresh strawberries right before serving. You don't want to freeze your berries, so it has to be done at the very end.